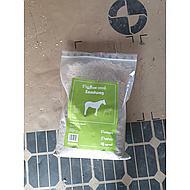 Ideal product for horses and ponies that eat sand or are on poor meadows and therefore get too much sand. A maintenance cure of 6-7 days can be given each month, unless a veterinarian prescribes otherwise. With administration longer than 7 days, the effect can be reduced. Mix through the feed. To prevent blowing away, the product can be lightly moistened. In combination with omega oils (eg linseed oil) psyllium can remove more sand from the intestines. Horses often find flaxseed oil tasty, which also makes the psyllium easier to eat. Always ensure sufficient roughage. More and more veterinarians are convinced that the binding effect of psyllium seed actually helps to drain sand into the gastrointestinal tract. 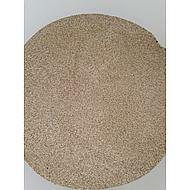 Psyllium seed is a 100% natural fiber that binds the moisture in the intestines and turns into a jelly. This has a dual effect. First, it stimulates the movements of the intestines, making the horse better able to drain the sand. In addition, psyllium provides a jelly-like sticky mass in the intestines. The sand left behind in the intestines adheres to this and is thus transported away. Psyllium seed appears to have the best effect if you give a 7-day cure. This treatment can be repeated once a month. With daily use for a longer period of time, the effect on the intestinal function becomes less; the intestines become accustomed to the intestinal contents and are less stimulated after a while. 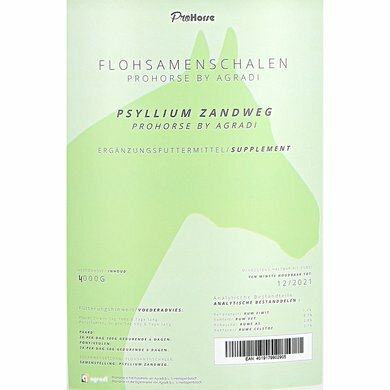 Psyllium has been used for some years in horses that eat sand and there are absolutely no known side effects. Psyllium can be given as a precaution without any worries. It is easy to test yourself if your horse has sand in the intestines. Take 5 to 6 manure balls and put them in a bucket, half full with water. When there is more than one teaspoon of sand on the bottom after an hour, the horse has received too much sand. In this case it is advisable to give a psyllium cure. After a severe colic attack (for no demonstrable reason, maybe eating sand was the problem) I give these fibers to my horse once a month for a week. So far that seems to work, but can also be a coincidence. 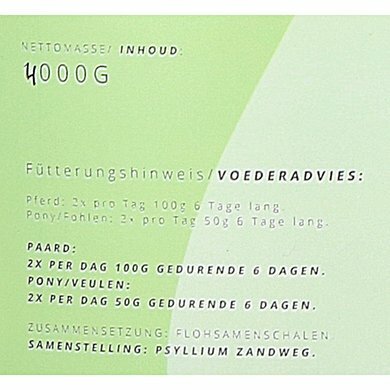 Answer: For ponies the recommended amount is 2x pd 50 gram and for horses 2x pd 100 gram. Question: Can these fibers be mixed by the slobber? Answer: Unfortunately there is no scoop here. However, you can order this separately with article number: Z100079. 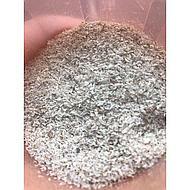 Question: for how many days is a bag of psyllium sand-way fibers? is 1 bag also 1 cure or? Answer: It is advisable to give the psyllium for at least 1 week and at the end of the week to see if a longer period is needed. This is only necessary if there is still sand in the manure. Depending on how much and how long you are feeding, the bag can be used for more than 1 cure. 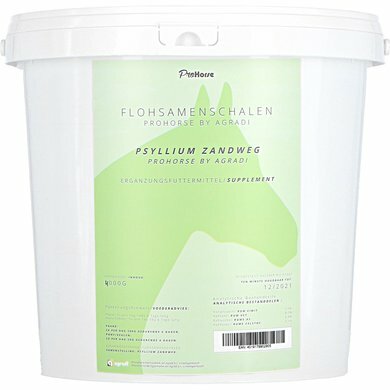 Question: Can I give psyllium sand-way fibers to a pregnant mare? Answer: There are no indications that psyllium would affect pregnancy. Question: Do the fibers have to be dry or wet over the feed? Answer: The fibers can be given dry or wet with the feed. Question: How long do I have to give the psyllium sand-way fibers? Answer: Dear Annemarie, It is best to give the sand-way fibers a week. If you do not have sand in the manure after that week, you can stop it for a while. If you still find sand in the manure after this week, it is better to continue feeding the fibers as long as necessary. There is no harm in feeding these fibers for a longer period of time. With kind regards, customer service Agradi. Question: our haflinger has had spray droppings for a month now and then. We give good hay and chunks and beet pulp. What do you advise us. Thanks in advance. 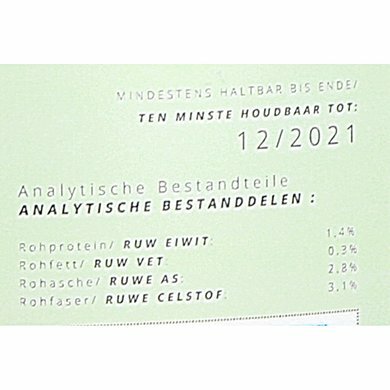 Question: How much is the right dose to give to a 500 kg horse?